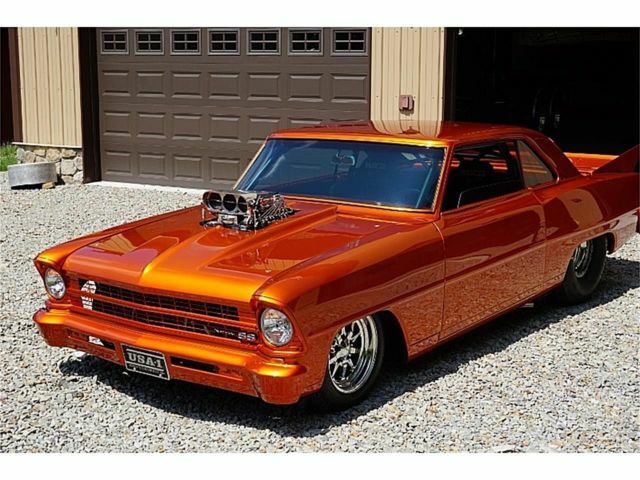 The most radical 1967 Nova SuperSporton the planet. This was an open check book masterpiece that costover $250,000.00 to build. The paint work,art and airbrushingaresome of the most mind blowing graphics you will ever see on an American muscle car. The paint and artwork alone totaled over $40,000.00. I have two 5 inch binders with every receipt and blueprint used on this build.Even pictures of it brand new back in 1967 and how it was found in California with only 40,000 original miles on a no hit body. 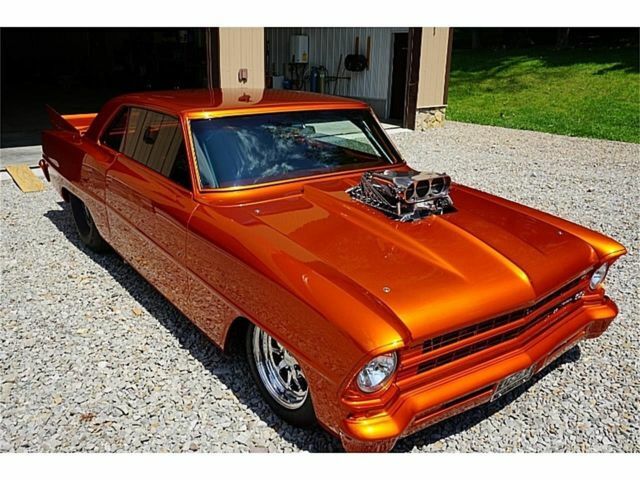 This is a real 118 Nova SuperSport and I even have the original Protecto Plateand warranty book for the car. 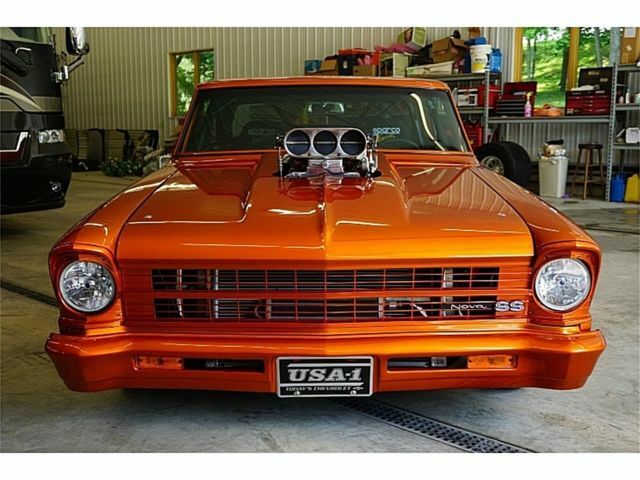 What the carhas now becomeis nicknamed “Agent Orange”.The Nova has a brand new Nascar 900 horse power Fast fuel electronic fuelinjected Chevy 406 small block with 871 B&M Super charger and 16 fuel injectors.5 speed street version Lenco transmission. Mark Williams Pro 9 aluminum 9″rear with 4.11 gears. Plumbed for nitrous with 16 nitrous injectorsbut never used. Wilwood four wheel disc brakes, Budnik wheels and also a set of Weld Beadlock wheels with Hoosier street slicks that are on the car now. Both sets go with the car. The car has Power windows, Power door latches and Power trunk all onthe key fob. Also HID head lamps. This is a one off custom with shaved door handles andremoved side vent windows. The door handles are real 5 inch Daggers that tilt back to open the door. The nitrousknobs are also one off hatchet axe handles.The street version Lenco trans not only makes driving fun but very driver friendly. The power to weight ratio on this car is crazy, One of the fastest cars I have ever driven. Lets not forget what this car sounds like it is one of the Nastiest sounding street cars you will ever have the privilege to hear. The sound comes from aNascar inspired all aluminized oval exhaust that exits right infront of the rear tire. The undercarriage is spotless, Email or callme if interested in undercarriage pics. Thebuild quality of this car is incredible, I promise youpeople will followyouwhen driving thiscar just to takepictures and talk to you aboutthe car. The car has never been raced but I have done a few burnouts !!! I’ve seen (and heard) this car quite a few times in Irwin, PA. Curious if it’s available for sale?